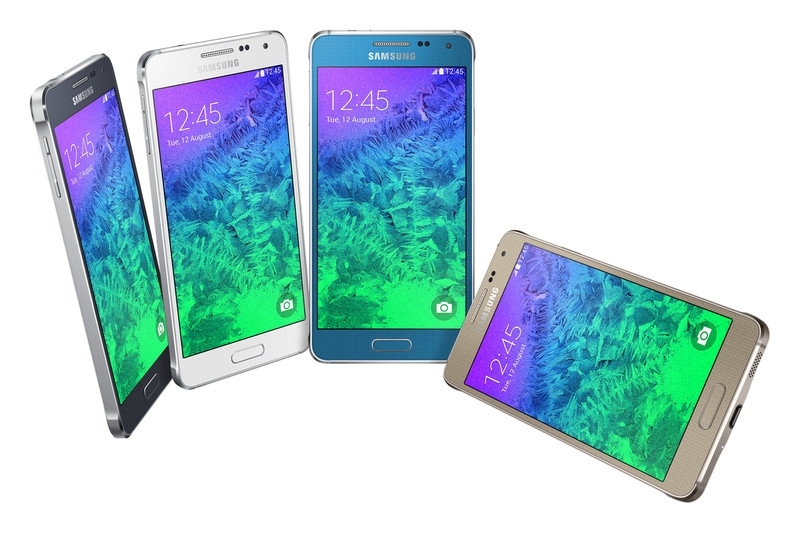 Following a number of leaks, Samsung has officially unveiled the Galaxy Alpha, the first smartphone in their line-up to ditch the signature all-plastic body for a more premium metal finish. It's also the slimmest Galaxy handset to date at just 6.7mm thick, making this a true display of what Samsung's design team is capable of. Going on the product shots provided by Samsung, the Alpha appears to be a mash-up of the iPhone 5s and the Galaxy S II, utilizing a more rectangular body than the Galaxy S5. The removable back cover is still plastic though, featuring a dot-patterned design. Hardware-wise, the Galaxy Alpha will be available in two variants: a Snapdragon 801 powered model for markets such as the US, and an Exynos 5 Octa 5430 powered model for the rest. The Exynos 5430 hasn't been fully detailed by Samsung just yet, but we do know it includes a 1.8 GHz quad-core Cortex-A15 CPU alongside a 1.3 GHz quad-core Cortex-A7 CPU and a Mali-T628MP6 GPU. Other specs include 2 GB of RAM, a 12-megapixel rear camera capable of Ultra HD video recording, 32 GB of internal storage (but no microSD card slot), a 1,860 mAh battery, and a 4.7-inch Super AMOLED display with a resolution of 1280 x 720. The included Intel XMM7260 modem gives the international version Category 6 LTE, supporting speeds up to 300 Mbps. The Galaxy Alpha, running Android 4.4.4, will be available at the beginning of September. No pricing has been given, although the premium chassis and mix of mid-range and high-end specs indicates it'll sit just below the Galaxy S5 in the company's smartphone line.